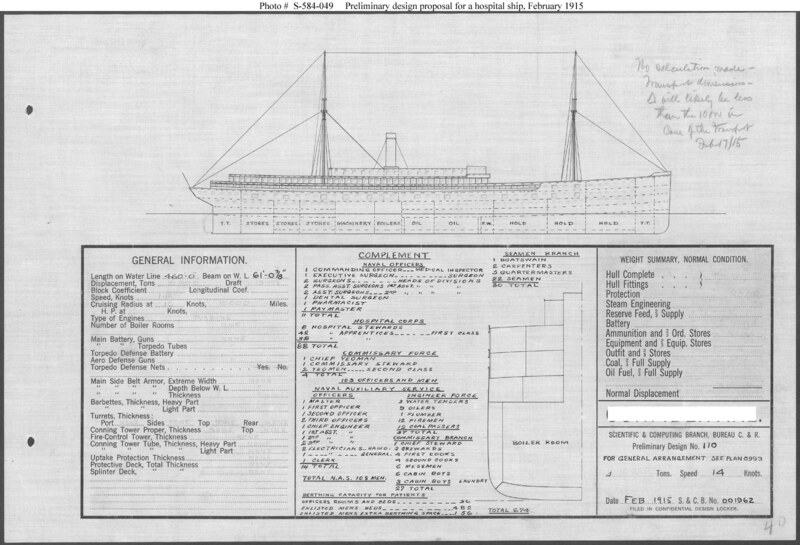 Preliminary design plan prepared for the Navy Department during consideration of a design for a hospital ship to be included in the Fiscal Year 1917 program. This plan was intended to satisfy characteristics issued on 12 April 1913 by the General Board. This design concept, adapted from that used for transport Henderson (Transport # 1, see Photo # S-584-074), was selected for construction of the Relief (Hospital Ship # 1), built during 1917 to 1920. This plan provides a total berthing capacity of 674 for patients, no armament, and a speed of 14 knots in a ship 460 feet long on the water line, about 61 feet in beam, with a normal displacement of somewhat less than 10,000 tons.